Juniper’s technology and its 9,000 employees worldwide are the force behind much of the networked world. Google, Comcast, Netflix and Facebook — along with thousands of service providers, business enterprises and public sector organizations — rely on Juniper innovation to connect the planet. In short, Juniper has engineered much of our hyper-paced, deeply interconnected world. 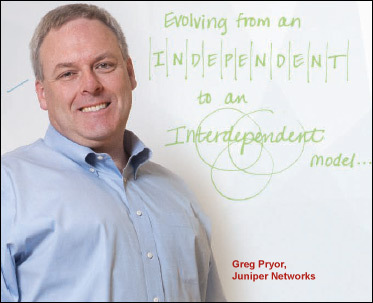 Being on the forefront of networking technology also requires new ways of leading and working, according to Greg Pryor, Juniper’s vice president of Leadership and Organization Effectiveness. With interdependence as the frame — one that has resonated with the leadership team — increasing Juniper’s ability to span boundaries became an important path forward. CCL’s boundary spanning leadership research and practice shows that as the world gets flatter and more interconnected, many barriers and boundaries remain. Leaders and organizations can either be stymied by these challenges or learn to span boundaries to find disruptive innovations. Guided by CCL’s boundary spanning insights, Juniper embraced a major effort to renew and align its values with the company’s vision, business strategy and brand. “Drawing on the perspectives of employees across the business and around the world, we sought to clearly align who we aspired to be on the outside to customers and to the industry, with who we are on the inside,” explains Greg. Deliberately bridging the five leadership boundaries, Juniper’s values, known as the Juniper Way, were renewed over a period of months. Then, the boundary spanning work shifted to engaging all colleagues and putting those values into action.